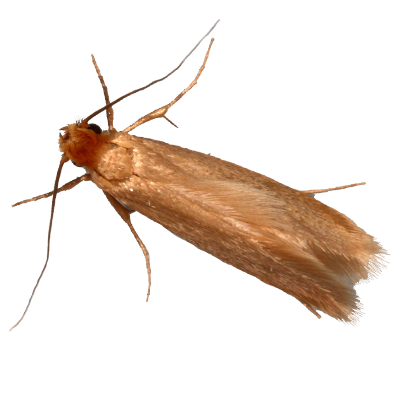 Tineola bisselliella, or clothes moths, can be identified by the reddish-gold hair on the top of their heads, and golden hairs fringed to their wings. Adult clothes moths are about a 1/2 inch in length. They are not attracted to light, so you can find them in darker spaces such as closets where larvae is then produced, and feeds on clothing. Clothes moths don’t travel far, they can usually only be found where the infestation takes place. They have a unique and distinct flying pattern by only fluttering around without a direct pattern. Until the larvae are grown, they stay in a silk case that will take the color of the item of clothing they are attached to, making it difficult to distinguish if there is a pest infestation. Larvae are able to feed out of either end of the silk case, and they feed mainly on wool clothing, or any fabric that has wool in it. They are also attracted to fabrics with the scent of food or perspiration.